As the day of your Laser Eye Surgery operation approaches, it is usual to become a little nervous, and have questions that you would like to ask. No matter how experienced the surgeon, many people still think that they will be the patient where it all goes wrong! In reality, complications are extremely rare, and generally when they do occur, good aftercare will resolve any issues. However, in order to put patients’ minds at rest we have devised a step-by-step account of our treatment approach, hopefully answering many of your potential questions. Our initial meeting is a chance to put you at ease and assess whether you are suitable for Laser Eye Surgery. This is done by using a range of sophisticated tests that will truly discover the best method to correct your vision. Eye drops are used to minimise any slight discomfort, and we will also ask questions about your general health, diet and lifestyle. Expect the consultation to take up to two hours. Unlike other clinics, you will meet your surgeon at your first appointment, and they will explain the best course of treatment, along with any benefits or disadvantages. Our motto is “this is Harley Street, not the High Street”. As such, we take our time and offer a quality standard of care to our patients. The initial consultation fee is £125, and at the end of the appointment your surgeon will explain whether a laser eye operation is your best option. The beauty of our clinic is that we can offer solutions to all refractive vision errors – if one treatment is not suitable, then another may be. It is important to note that should you proceed with treatment, the consultation fee will be deducted from the price of surgery, in effect making this a FREE consultation. If you are happy with your surgeons recommendations, we will schedule an appointment for the procedure to take place. In the days or weeks before the operation, you can carry on living life as normal. No special measures or dietary adaptations are needed. Book your holidays and time off work accordingly. We usually recommend 48 hours but recovery time can vary. Err on the side of caution. Make sure you have transport to and from the clinic. No driving on surgery day. Consider any strenuous activities you have planned post-surgery. We advise avoiding contact sports for at least a few weeks. Depending on your employer, it may be possible to have your operation while on paid sick leave. Enquire well in advance to see if this could apply to you. After welcoming you into the clinic, our reception team will make sure you are well looked after. Feel free to have a cup of coffee or tea! Once inside the laser eye surgery suite, your surgeon will discuss the procedure, and give you a detailed account of what’s ahead. Don’t worry – The entire operation will take less than 20 minutes for both eyes! Anaesthetic drops are used to numb the eye. To prevent blinking, we then use an eye lid guard. With LASIK, the laser is used to create a corneal flap, completely blade-free. If you choose LASEK, the laser softens the surface eye cells, which are then gently moved back with a blade. 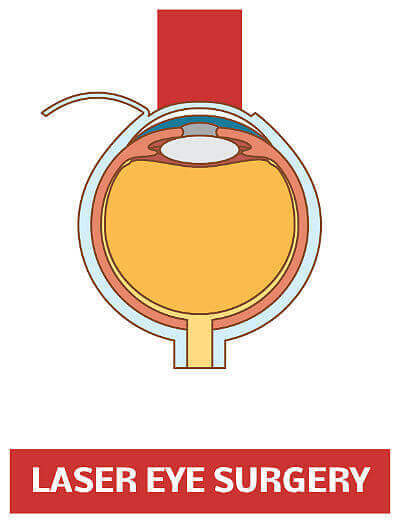 In both techniques, corneal tissue is then reshaped using the Excimer Laser. An Advanced Eye Tracking system guides the laser by following the movement of your eye. A soft contact lens will be placed in each eye, to protect your vision as the eyes heal. A specialist nurse will advise you of best practices and medications needed during your recovery phase. Most of our patients are surprised at how quickly the operation passes. The laser itself is invisible and you will only see a flashing light. Also, please be aware that when the cornea is being reshaped, there will be a slight smell. This is a completely normal part of the procedure! Generally, a stinging sensation is noticed, but the majority of laser vision corrections occur with very little pain, and patients are happy and comfortable when making the journey home. Sometimes, people like to bring along a friend or family member to watch their live surgery from behind our transparent glass screen. This is fine – we regularly have opticians and other surgeons watching our treatments, so are happy to accommodate others too. If you opt for the LASIK procedure, your aftercare will start the day following surgery. With LASEK, it is a little different – aftercare commences 4 days after treatment. Vision itself improves very quickly. Improvements of 50-60% often occur within 10 minutes of surgery being performed. Expect dryness to be a normal part of the eye healing process. This usually takes 2-3 months to fully resolve. Eye drops will help to improve this. Due to our extensive optometrist network, post-surgery care can be performed at numerous locations across the UK, making follow-ups more convenient and less expensive for our patients. Driving is not advised until you have had at least one initial check to assess your eyes healing. With LASIK, 2 days is a common time-frame to expect to be driving again. LASEK is slightly longer; expect to be off the road for around 5 days. Aside, from this, you are free to resume your work and social life as normal. No need to miss the gym or other leisurely activities, although contact sports should be avoided until the eyes have fully healed (around 4-6 weeks). Have we managed to answer some of your questions? Do you still need some advice? Call us today on 0800 652 4878 – we are happy to help.